We currently provide three core services. Satellites can enable us to look at large areas of land, or zoom in to see objects as small as a manhole cover. A major benefit of using Earth observation (EO) data in an evidential context is that vast quantities of data are collected and then archived, which can then be purchased from image suppliers. We are familiar with the large numbers of supplier sales portals and can where it’s available often locate historical imagery that matches the client’s needs. As well as sourcing relevant EO data we can also offer expert interpretation as to what an image shows and its significance. An expert report can be extremely useful in helping alert clients to problems and focus ground-based work, saving time and resources. It can also be extremely important in any legal case as evidence. We can often provide clients with an expert witness who can attend court to give valuable support to the evidence and the case. Since the establishment of the company we have conducted investigations for a wide variety of clients in many different countries and from the following sectors: property, police, insurance, security, regulatory agencies, environmental NGOs, and the general public. Waste crime is a very serious problem, costing governments huge amounts of money. Air & Space Evidence has the skills and data to help regulators tackle waste crime, providing intelligent information from satellite data which will allow them to act more rapidly and effectively. We can detect illegal sites. It has not been possible to monitor large areas of a country routinely and systematically for unknown illegal waste sites before under existing regulatory budgets. We have developed an award-winning detection model, which uses satellite data and algorithms to find unknown illegal sites. This detection model has proved to work extremely effectively and can pro-actively detect and stop illegal sites over very large areas, quickly, and cost-effectively, increasing the likelihood of catching organised waste criminals before they disappear. Early interventions will have significantly better economic and environmental outcomes. We can risk profile the detection results. Intelligence data without context can result in poor decisions and the inefficient use of resources. We can profile the risk, categorising violations in terms of harm and culpability and prioritise sites of interest after identification by our model. This will enable a faster and more targeted regulatory approach, increasing the impact and efficiency of interventions. We can deter waste crime. Covert satellite monitoring is proven to have a greater deterrent effect than conventional approaches, as waste criminals don’t know when and where they are being monitored - raising the risk in their minds of being caught. Deterring criminality is cheaper than reacting to it. We can conduct historical site analysis. Archived satellite data can allow us to “go back in time” and conduct a forensic examination of what criminality was happening, where and when at that site. It can be used to show the investigator and court the length of time an illegal activity was taking place. 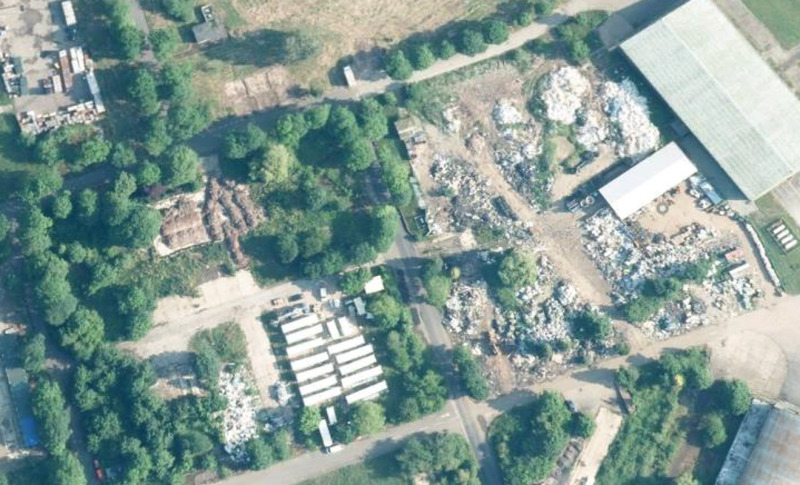 We can monitor permitted waste sites. Waste crime is not just limited to those operating outside of the regulatory framework. We can undertake periodic satellite checks at sites to ensure that permits or exemptions are being adhered to, which can alert regulators to problems as they arise, so they can prioritise inspections. We can track waste. Existing methods of tracking waste focus mainly on tracking vehicles, or paperwork chains. As soon as waste leaves the vehicles the chain is broken and waste is no longer tracked and records can be easily forged. We are developing a service to industry stakeholders and regulators, using GNSS satellite technologies to physically track the waste itself, allowing them to have confirmation as to where the waste has gone, rather than just potential movements. We can provide assurance of supply chains and that the right waste has gone to right place. Using our EO services enables cost effective and intelligent decision-making, allowing clients to see what is going on in relation to their assets. This will allow them to make quick and better-informed decisions about assets in any location on Earth without the expense of having personally to travel to them. We can help clients de-risk in investment by having a much clearer picture of the condition of assets, potential liabilities, and what had historically taken place on any land of interest in the past (particularly in support of purchase or takeover situations). This could include analysis of things such as subsidence, tendency for flooding, compliance with legislation, and proximity to coastal erosion. We can also provide intelligence and quality assurance information about the condition of land and assets, and whether there have been any changes to these, to ensure investments are financially safe and well-managed. This could include identifying non-compliance with laws, incursions on land, fly-tipping or waste dumping, squatting, or harmful activities taking place in directly adjacent landholdings. We can demonstrate to regulatory bodies or industry companies what had historically been on, or taking place on, land or assets and at what time. This could include cases involving licence classifications or insurance disputes.